Want to give something unique? Give a seasoning collection that is inspired by our beautiful area! This basket features our oldest and newest culinary enhancement concoctions. All blends are made with 100% natural ingredients and hand-blended. All Round Good Grinder Blend, 3 oz. grinder bottle, our first and best selling blend. Once you try it you will be hooked. Savannah Summer Salt Blend, 3.0 oz. bottle, try our version of a season all blend on everything from burgers to wings, fries to corn on the cobb, even flavoring casseroles and eggs. This is really an “all seasons” blend and comes in handy for so many foods and you will want to keep it within easy reach at all times. 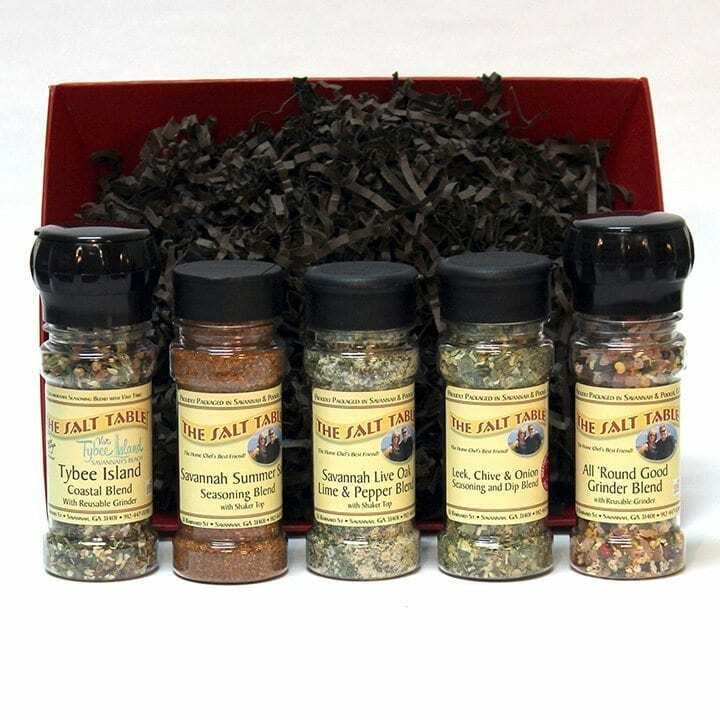 Tybee Island Coastal Blend, 2.5 oz. grinder bottle, this blend of salt and spices was designed to honor the seafood traditions of Tybee Island, Savannah’s Beach! It adds a savory Southern flavor to your boiled, and steamed seafood dishes, or just sprinkle it on fish, eggs, or broiled veggies. Winner of the 2015 Flavor of Georgia Contest. You’ll love it. Leek Chive & Onion Seasoning and Dip Blend, 1.3 oz. bottle, a winner in the 2016 Flavor of Georgia Contest. This is great as a dip for chips and veggies, or a topper for baked potatoes, just mix with sour cream. It is also wonderful in flavoring tomato or broth soups, anything potato, or as an omelet seasoning. Add a tablespoon to mayonnaise for a flavorful sandwich spread. Very savory. Live Oak Lime and Pepper Blend, 2.5 oz. bottle, one of our more requested blends starts with the question, “What do you recommend for fish and chicken?” Inspired by the Live Oak Trees that are bold as well as breathtaking. This blend brings the citrus tang of real lime along with the kick of black pepper that will make your dishes stand out and be noticed.